I subscribe to 12 daily Google mail alerts -- one for each of the countries for which I run search engines. There's only one problem. When I go on a week's holiday I return to find 84 Google alerts waiting for me. Since it's impossible to read them all, I simply delete them. Alternatively, before leaving for a holiday I go to settings and delete all the alerts and then reinstall them after I return. A great waste of time. I could set a label and use that to delete all the alerts at one go. But I've always wondered why Google simply doesn't have a pause feature so that I can pause the alerts when I leave for an extended stay and restart them when I return. It's nice to discover that even Google commits the occasional errror. For some time, along with the search results, it has been returning the addresses of some urls, with a clickable link that opens a map right on the search page. But sometimes the address and the resulting map are incorrect. 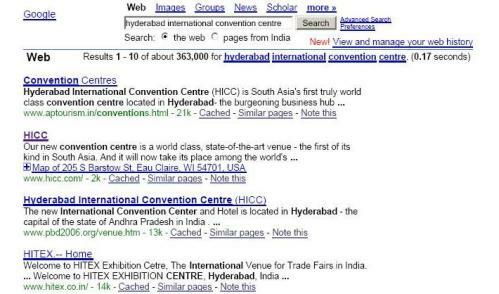 Type "Hyderabad International Convention Centre" as the search term (without the quotes) and Google returns the url www.hicc.com as the second result along with an address. But the convention centre is in Hyderabad, India. And the address is: 205 S Barstow St, Eau Claire, WI 54701, USA. A screen capture can be seen below.